In the past, thrill seekers looking to ride a “standing wave” have purposely dug a channel into the berm that forms every summer on Aliso Beach at the mouth of the creek in order to release millions of gallons water into the surf zone. Some summers, runoff is so copious, the berm cannot contain the volume and spontaneously overflows. 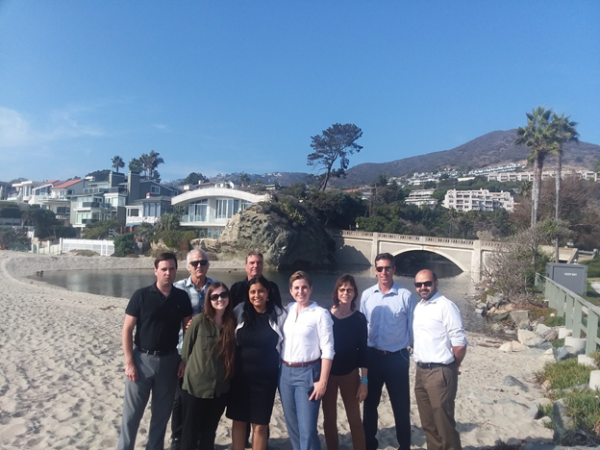 Thanks to a collaboration of local agencies, a 50-foot wide and 3-foot tall natural beach sand berm at Aliso Beach remained intact all summer preventing creek water from flowing into the ocean. Photo courtesy of Laguna Bluebelt. Neither of those things happened this summer. 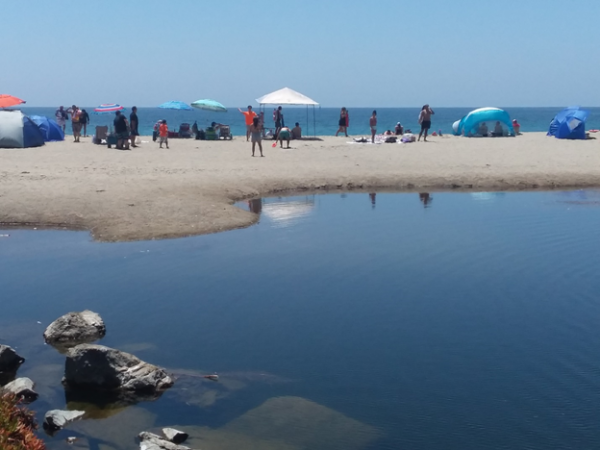 A 50-foot wide and 3-foot tall natural beach sand berm at Aliso Beach remained intact all summer preventing creek water, polluted from inland runoff,from flowing into the ocean and creating dangerous rip currents. Representatives from Laguna Bluebelt Coalition, OC Public Works, Moulton Niguel Water District, Orange County Coastkeeper and the cities of Laguna Niguel and Mission Viejo met last monthto review progress and reconfirm their commitment to tackle ways to reduce dry weather urban runoff from flowing into the Aliso Creek. “The presence of a large natural beach sand berm is a clear indication of a significant reduction in the quantity of urban runoff being released onto streets and waterways leading to the creek,” Jinger Wallace, of Laguna Bluebelt, said in a statement. In addition to reducing runoff,collaboration between Supervisor Bartlett’s staff, OC Lifeguards and members of Laguna Bluebelt facilitated new signage at Aliso Beach alerting beachgoers that anyone illegally digging out the berm could receive a ticket from OC Parks rangers or police. OC Parks said no citations were issued over the summer. Wallace spearheaded an educational pilot program last February, using a $12,000 grant from the Moulton Niguel Water District, to reduce contaminated runoff into Aliso Creek from golf courses, greenbelt roadways, parks and homes where over irrigation sends fertilizers, chemicals and road contaminates into creeks that flow to the ocean. Bluebelt volunteers canvased neighborhoods in the Briarglenn developments in the city of Aliso Viejo, an area identified by OC Public Works, who uses ultra-sonic devices to monitor flow, as having particularly high levels of runoff. Homeowners were given recommendations for professional services in updating sprinkler systems and making landscaping less thirsty. The volunteers also distributed outreach materials like door hangers and post cards to alert homeowners of excessive water usage. Wallace said it was not a water conservation program, but more directed at keeping water from flowing into storm drains. Urban Runoff Partnership Participants (back row, left to right): Joe Ames, Mission Viejo; Mike Beanan, Laguna Bluebelt; Ray Hiemstra, OC Coastkeeper; (Front row, left to right): Amanda Aprahamian, OC Public Works; Monobina Mukherjee, Moulton Niguel; Lindsey Stuvick; Moulton Niguel; Jinger Wallace, Laguna Bluebelt; Grant Sharp; OC Public Works; Hal Ghafari, Laguna Niguel. Photo courtesy of Laguna Bluebelt. TheMoulton Niguel Water Districtwhich servesAliso Viejo, Laguna Niguel, Laguna Hills, Mission Viejo, San Juan Capistrano and Dana Point, plans tofurther detect and assess dry weather flows of runoff at the creek by installing 60 real-time flow monitors at each major storm drain in the Aliso Creek watershed. Funding will come from Metropolitan Water District grants. Additionally, the District received $300,000 in federal matching funds this month for its Advanced Metering Infrastructure program,to install radio transmitters and automated meters at nearly 4,900 residential, commercial, and fire protection sites in its service area. The automated meters will help the District detect water leaks, improve operations, and allow customers to monitor their water usage. “This is not just a one project and done initiative,” Drew Atwater of Moulton Niguel said. “We are taking a more integrated approach and we’re excited by these collaborative meetings,” he added.